Michael Gray honored as Producer of the Year. Live seminars by Michael Gray, CPA scheduled for December. Stock Options telephone seminar by Michael Gray, CPA. Social Security wage base increases for 2012. Retirement contribution ceilings increased for 2012. IRS says how to make protective estate tax claims. More tax return preparers must efile tax returns. Draft form issued for reporting foreign assets. IRS keeps â€œhigh-lowâ€� method for travel expenses. Worker Classification Settlement Program offered. Michael Gray, CPA was honored as Producer of the Year by CreaTV San Jose for the series Financial Insider Weekly. 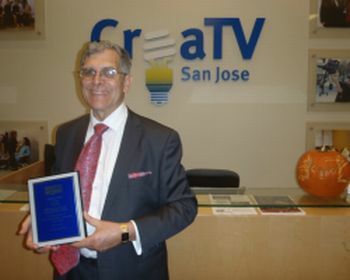 CreaTV, San Jose honored Michael Gray as Producer of the Year at its Annual Meeting on October 26, 2011. Luis Costa of CreaTV noted that Michael is the only producer with shows broadcast over 100 consecutive weeks without a repeat, and as a model of preparation for his recording sessions. Thatâ€™s right! Itâ€™s here already! Thanksgiving falls on Thursday, November 24 this year. With the coming holidays, continuing education days, and a planned vacation for the third week of December, Michael Gray will have very limited availability for year-end tax planning meetings. Reserve your appointment now by calling Dawn Siemer on Monday, Wednesday or Friday at 408-918-3162. My brother, Stephen, and I are celebrating our 60th birthday this year. We are thankful for many blessings, including that our mother, Eleanor Gray, is still living and reasonably healthy. (Steve and Mom recently enjoyed an Hawaiian vacation that Mom has just recovered from.) I am also thankful for my family, including Janet, my wife and partner for 40 years, our three grown children, our daughterâ€™s husbands and our three grandchildren. They are the real treasures in my life. Michael Gray will be giving two live seminars during December 2011. On December 2, he will be speaking about â€œYear End Tax Planning For Employee Stock Optionsâ€�. On December 9, he will be speaking about â€œTax Planning For Real Estate Short Sales and Foreclosuresâ€�. Both seminars will take place from noon to 1:30 p.m. at Hobeeâ€™s Restaurant in the Pruneyard, in Campbell. Lunch is included. The fee for participants is $97. To get more details or make a reservation, call Dawn Siemer on Mondays, Wednesdays or Fridays at 408-918-3162 or visit our website at www.stockoptionadvisors.com/nov2011seminar.shtml for â€œYear End Tax Planning for Employee Stock Optionsâ€� or www.realestateinvestingtax.com/shortsale-seminar.shtml for â€œTax Planning for Real Estate Short Sales and Foreclosuresâ€�. Stock Options telephone seminar by Michael Gray, CPA on November 25. Michael Gray will be giving a telephone seminar, â€œYear-End Tax Planning For Employee Stock Optionsâ€�, Friday, November 25 from 1 to 2:30 p.m. Pacific Time. The fee for participants is $97. To get more details or make a reservation, call Dawn Siemer at 408-918-3161 or visit www.stockoptionadvisors.com/nov2011teleseminar.shtml. The Social Security Administration has announced that the wage base for computing the Social Security tax has increased to $110,100 for 2012 from $106,800. The total social security plus Medicare tax rate for employers and employees is scheduled to be 7.65% each. â€“ 6.2% for the social security tax and 1.45% for Medicare. For 2011, the employee social security tax rate is 4.2%. (President Obama has asked Congress to extend the lower employee rate and to reduce the employer rate as part of his Jobs stimulation package.) There is no ceiling for wages subject to the Medicare tax. For self-employed persons, the rates are the employer plus the employee rate, 13.3% for 2011 and scheduled to be 15.3% for 2012, unless Congress takes action to reduce the rates. The limitation on the annual benefit under a defined benefit plan is increased from $195,000 to $200,000. The limit on annual additions to a participantâ€™s defined contribution plans is increased from $49,000 to $50,000. The elective contribution for 401(k) plans and certain deferred compensation plans of state and local governments and tax-exempt organizations is increased from $16,500 to $17,000. The 401(k) â€œcatch up contributionâ€� for individuals age 50 or greater is $5,500. The maximum contribution to a SIMPLE remains at $11,500. The maximum IRA contribution for 2012 remains $5,000. The â€œcatch upâ€� contribution for individuals age 50 or greater to an IRA for 2012 remains $1,000. In some cases, estates canâ€™t currently claim deductions on their estate tax returns because the expenses havenâ€™t been paid yet. The IRS recently explained the procedure for claiming a protective refund for these claims. If a protective claim is made on time, the deduction could be lost if the statute of limitations has expired for filing an amended estate tax return. The protective claim should be made using Form 706, Schedule PC, which will be first available with 2012 Form 706, or using Form 843 (Claim for Refund), if Form 706 was previously filed. The estate must notify the IRS within 90 days after the claim is paid or the amount becomes certain, whichever is later. The notice is made by filing a supplemental Form 706 or Form 843. More tax return preparers must efile tax returns during 2012 tax season. The IRS has reminded tax return preparers that the threshold for required efiling of income tax returns during the 2012 tax season will be eleven or more tax returns, increased from 100 or more income tax returns for 2011. A client may still choose to file an income tax return on paper. Some tax returns canâ€™t be efiled because they include forms that canâ€™t be processed electronically. Some preparers may qualify for a hardship waiver. If a tax return canâ€™t be processed by efiling, Form 8948, Preparer Explanation for Not Filing Electronically, should be attached to the tax return and the client, not the preparer, should mail the tax return. Tax return preparers who havenâ€™t efiled tax returns before should apply for their electronic filing identification numbers now so they will have them for the upcoming tax season. The Hiring Incentives to Restore Employment Act, enacted March 18, 2010, included a provision to require disclosure of certain foreign accounts and assets on U.S. Individual Income Tax Returns for tax years beginning after March 18, 2010. For most taxpayers, 2011 is scheduled to be the first year that the report is required. The IRS has issued draft Form 8938, Statement of Specified Foreign Financial Assets, and instructions. The form is required for certain foreign investment accounts and foreign trusts owned by U.S. taxpayers. Unmarried taxpayers or married persons filing separate returns would submit the form if they have foreign financial assets with a value exceeding $50,000 at the end or the year or $100,000 at any time during the year. Married taxpayers filing a joint return would submit the form if they have foreign financial assets with a value exceeding $100,000 at the end of the year or $200,000 at any time during the year. If the information has already been reported on certain other IRS forms, such as Form 3520 for foreign estates or trusts or Form 8621 for Passive Foreign Investment Companies (PFICs), the information wonâ€™t be duplicated on Form 8938, but the other forms will be listed. The IRS has said that taxpayers wonâ€™t be required to report the information with their 2011 income tax returns if the final Form 8938 hasnâ€™t been issued when they file their income tax returns. The IRS reversed a previous announcement and will not discontinue the â€œhigh-lowâ€� method for substantiating travel expenses. The â€œhigh costâ€� per diem will be increased from $233 for 2011 to $242 for 2012, and the per diem for other â€œlow costâ€� locations will be increased from $160 for 2011 to $163 for 2012. The IRS has initiated a Voluntary Classification Settlement Program (VCSP) to enable employers to voluntarily reclassify their workers for federal employment tax purposes. Under the VCSP, penalties and interest will be waived for back payroll taxes and back years wonâ€™t be subject to audit relating to the reclassified workers. In order to qualify, the taxpayer must have consistently treated the workers as nonemployees and must have filed Forms 1099 for the workers for the three preceding calendar years (or for the period the employees worked for the taxpayer, if less than three years.) The taxpayer also canâ€™t currently be under audit by the IRS or Department of Labor. The employer will file Form 8952 at least 60 days before the date the employer wants to start treating the workers or class of workers as employees. The IRS will notify the employer whether or not the application is accepted. There is also a special six-year statute of limitations for the first three years under the program. Taxpayers who employ independent contractors should consult with their tax advisors and possibly a tax attorney whether participating in the VCSP makes sense.